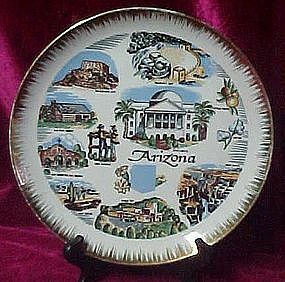 Scenic Arizona state souvenir plate, 10 1/8"
Nice vintage souvenir plate of the state of Arizona featuring 11 areas of interest. Has Roosevelt dam, Grand Canyon, the state capitol, Fort Misery, cactus and other points of interest. Cupped edges with 23k gold brushed trim. No chips or cracks. Porcelain hanger on the back can't be used any longer.